Matasuna Records is delighted to reissue this Peruvian masterpiece by Otto de Rojas – one of the best Piano players from Peru. In 1976 he and his band Los Ultra 76 released this superb single mixing Latin with Funk, Jazz and Disco. Both tracks getting remastered to provide the best possible sound – even better than on the original 45! A 7inch not to be missed. Choca Las Caderas keeps its promises: with this tune the hips certainly won’t stay still! The song builds its vibe with a funky guitar riff, a groovy bass line and Roja’s virtuoso piano playing. The horn section and the vocals drive the tune to its climax: pure fire for the dance floor! On the flipside there’s another jewel: Al Ritmo del Bump Bump – a Peruvian cover version of Soulful Strut by the US Soul-Jazz band Young-Holt Unlimited. 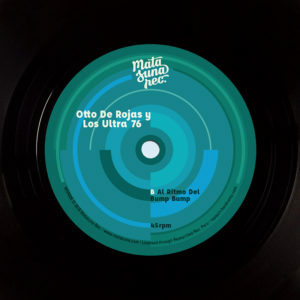 Otto de Rojas and his Ultra 76’s adapt the original in their own groove-oriented way of playing: faster rhythm, amazing wah-wah guitars, layers of electric piano over a funky bass and brass. Another heater for the floors!